Denise Greenwood - The Beaten Track: So Enthralled, a reader missed their train station stop. So Enthralled, a reader missed their train station stop. 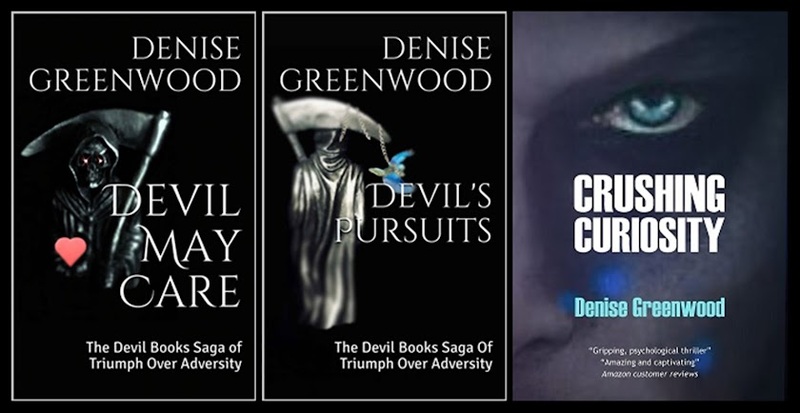 The first reviews of the Devil Books saga of triumph over adversity are on Amazon. "An excellent read; very enthralling." "The story focuses on the lives of prime characters, unfolding a rich tapestry of each, with unique personalities." "An engrossing piece of contemporary fiction; the author manages to captivate the reader making this a book you just don't want to put down. I can highly recommend this book." "This is the second book in the author's trilogy, furthering the first to new levels. It continues the theme of the heroes from the first whilst introducing new characters with strange behaviours, tense relationships and sinister and intriguing undertones." "Skilfully portrayed and enriched with dark humour." "I was so enthralled with how event were unfolding, whilst reading on the train, I inadvertently missed my stop by 2 stations!"